Here are the Finished Products...Stay posted over the Next Week to Learn About Everything Inside!! Every 6-12 months or so I try to refresh the food in our 72 hour kits. My purpose in this post is to inspire you to put together 72 hour kits for your family, if you haven't done so yet. Especially if you have little children. Think of your children little faces, hungry and tear-stained, cold and wet. When we become parents we make a solemn commitment to protect and care for these little ones. Moms must be prepared for all circumstances. It takes effort and a financial investment but it is ridiculous to not make this a priority. We built ours up over the course of several years to meet our needs. This is part one of three. First we'll talk food. Here is what we've got. It is important to remember to include things your family is accustomed to eating. And also some comfort foods for your children. For mine, it is their vitamins, pretzels and fruit leather. While we don't eat prepared food usually, I have found from experience, the preservatives are helpful in this situation. My homemade energy bars were rock hard in just a couple months. The store bought versions last infinitely longer. 3 Days worth of food for everyone. Organized by meals/days/family member. We also have lots of bubble and chewing gum. That is the jist of the menu. The children each have 2 water bottles per day. Brent and I have 3 per day. We also have 2 filtering water bottles. For heating water we have an Alco-Bright stove. A great indoor/outdoor survival stove with 10,000 BTU of heat. **My kids day would not be complete without their daily fix of gummy vitamins. One multi, one omega, and one calcium. It is their little indulgence for the day. They roll out of bed and start asking for them. The idea is to include nutrient dense food which is simple to prepare and lasts a long time. We also have 3 days worth of MRE food bars, 1200 calories a piece. If we got really hungry these would be helpful, or in the case of needing to help others or a longer duration without access to food. The food cost me about $80 shopping at both Target and Costco. I had a bunch left over, which I bagged and put in each of our cars. I buy organic, premium foods. You can do it for less if you sacrifice quality. I don't recommend it. How could I ever reccommend high fructose corn syrup and msg? And PLEASE!!! if you have better ideas, let me know. I can be dense. But I am like a sponge too. I love to soak up new information. 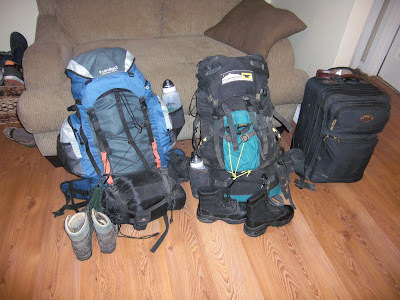 How many outfits do you pack? One change of clothes per person? I am trying to decide what to do about diapers - how many, etc. I guess that's one more good thing about your reusable ones! I put those milk boxes you posted a few months ago in mine. Ty loves them. I completely forgot about adding those milk boxes. We love them. Never crossed my mind. I will have to add them. I actually use the disposable diapers in my 72 hour kits. The washables are great for long term storage but on the go would be pretty messy. We are working on the exact same thing - trying to get done by hurricane season. 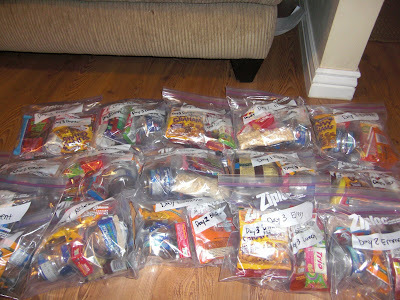 I packed food just like you did (day/meal) when Tom went to help hurricane victims. I never thought of doing the same for our 72 hr kits! I'll have to do that - it works great and Tom loved it. Hey Rebecca: I'm an occasional reader of your fine blog (very insightful!) and am working on getting my 72 hour kits in order. I remembered this post and looked it up as a rough guide when doing mine -- I would love to soak up any more tips and tricks that you have! :D Not a big deal, I just thought I would ask. PS: CONGRATS on the new baby girl! how very exciting. She will love to have an older brother -- something my little sister has that us older sisters are a little jealous of! How fun!